When Davidson College’s men’s basketball team played its way into the NCAA Tournament’s “Big Dance” on Monday night with a double-overtime victory over Western Carolina, a group of Davidson freshmen witnessed the moment in Americus in the smallest of ways. Tang is spending her spring break with fellow Bonner Scholars from Davidson who are working with The Fuller Center for Housing’s Americus-Sumter covenant partner on a Greater Blessing project in Andersonville, Ga., at the home of Rosemary Faulks, who has had trouble getting in and out of her house to receive dialysis treatments. Another group of college students, these from the College of Engineering at Penn State University also are spending their spring break working in Warwick, Ga. But they’re not spending their off time from building a new home with the Flint River Fuller Center at Lake Blackshear merely watching basketball. No, they’re playing basketball. “Of course, engineers playing sports …” Kathleen Prilutski says, her voice trailing off in an apparent admission of on-court ineptitude. The mechanical engineering major led an effort to bring students within the College of Engineering together. What developed was a work team composed of students from The American Society of Mechanical Engineers, Engineers Without Borders and a student philanthropic group known as Boulevard. 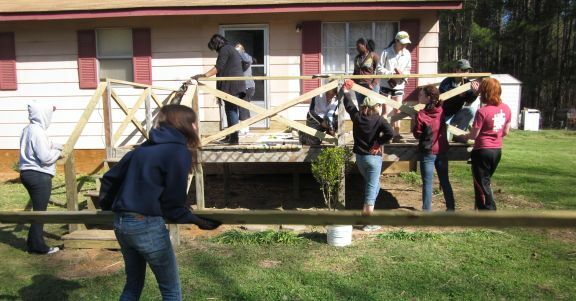 They are among 14 Student Builder groups working with various Fuller Center covenant partners during March. The Penn State engineering students are likely better at building houses than shooting basketballs. And nobody is happier about that than Walter Vinson. The long-time farmer, who has lived has entire life in Warwick, and wife Erica will be moving into the Wendy Martin Legacy Build home on which the students have been working this week. “It’s wonderful,” an emotional Vinson said Monday. “You don’t know how people feel about helping people until you find it out for yourself. It’s a great feeling to know how people care about each other. It’s so wonderful to see people come together, and I just thank each and every one for all that they’re doing. While Davidson students may have been beaming about their Southern Conference basketball title, the Penn State students were more excited about the beaming sunshine and warm temperatures Monday in Warwick, where it was 74 degrees at midday. At that same time, tt was about 36 degrees with snow still on the ground in State College, Pa.
For Jennifer Kearney, who plans to major in civil engineering and is a member of Engineers Without Borders, working with The Fuller Center this week is not just service work to add to her resume. 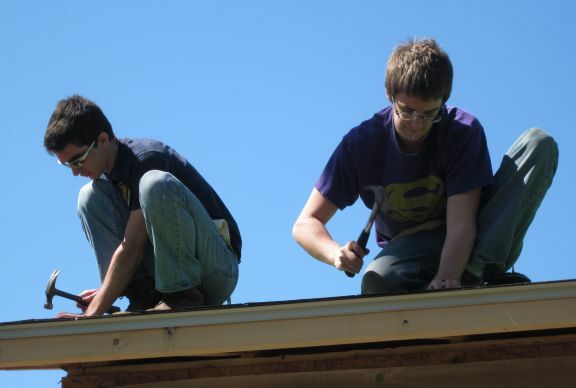 And for sophomore Andrew Balliet, serving others is nothing new as an Eagle Scout. But this trip has put a face on his project. Back in the equally small community of Andersonville, the Davidson students are all Bonner Scholars who must perform 280 hours of service work to maintain their scholarships. Freshman John Alexander Hall said while there’s nothing wrong with hitting the Gulf Coast or Cancun on spring break, he prefers the alternative of serving others during the break, even if it weren’t required of a Bonner Scholar. To learn more about The Fuller Center’s Student Builders program, click here. 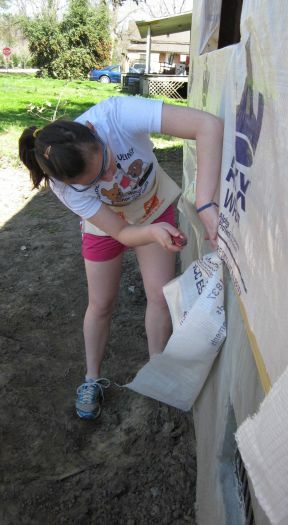 Click here to see photos of the students working: Penn State or Davidson. WALB-TV coverage of the Penn State group. Click below to view a video about the Penn State and Davidson students.